Two manual and pedal organ, 9 speaking stops, by Nelson of Durham, built in 1926-7, relocated to France. 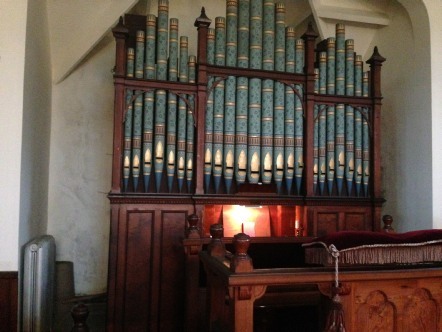 Two Manual and pedal organ, 13 speaking stops, by William Hill & Son, built in 1883 and revised in 1940, relocated to France. Two manual and pedal organ, 8 speaking stops, by Forster & Andrews, built in 1892 and revised by Gray & Davison in 1950, relocated to France. Two manual and pedal organ, 20 speaking stops, by John Cuthbert (1863), extensively rebuilt by Forster & Andrews in 1915, relocated to France. Two manual and pedal organ, 9 speaking stops, by Henry Jones, built in c.1900, relocated to Germany. Two manual and pedal organ, 10 speaking stops, by Laycock & Bannister, built in 1889, relocated to France.